HSBC today releases a report revealing that mid-market enterprises could take advantage of huge opportunities from international trade. In fact, exports currently account for only 17% of UK MMEs’ revenues (For the purpose of this study, mid-markets enterprises are defined as those with between 200 and 2,000 employees). Although, the total value of turnover accrued through these export sales is almost $180bn. HSBC Commercial Banking, in conjunction with Oxford Economics, explored the views of 1,400 MME senior executives in 14 countries in addition to in-depth economic analysis. The findings reveal that MME leaders in the UK are significantly less confident in the local economy than average (50% vs. 69%) and as to be expected they view Brexit as a far greater threat to growth than average (50% vs. 6%). However, despite this these leaders are focused upon increasing revenue from current markets as a strategy for growth rather than seeking out sales opportunities in new geographies. The US and neighbouring European economies such as France, Germany and Ireland are currently the largest export markets for UK-based MMEs. Furthermore, there is good news for policymakers for who decreasing the skills gap has been a priority in recent years in that UK MME leaders see much less of a threat from skill shortages than average (40% vs. 56%). Meanwhile these leaders were comparatively less optimistic when it comes to technology driven growth (45% vs. 55%) and the domestic opportunities that exist in general for entrepreneurs in the UK (39% vs. 47%). “MME firms are making a huge and growing contribution to the UK economy, with our estimates showing the number of MMEs in this country increased by 5% over two years. These MMEs have the potential to deliver even greater growth if they considered going to new markets. Many of the concerns they have, could in fact be addressed with an international strategy – whether that’s overcoming local economic uncertainty or capitalising on new skills and expertise. In an environment of lower growth, we must help these companies reap the benefits of international commerce, and just as importantly work to raise their profile as major economic contributors, and potentially influential government stakeholders”. MMEs are the backbone of the global economy, making significant contribution to growth and employment. It is estimated that the 433,000 MME companies across 14 countries covered by this study directly employed 208 million people – equivalent to the population of Brazil – and support $3.4 trillion in exports. It is estimated that in just two years the direct contribution of MMEs to global GDP increased by 9% and the number of jobs they support grew by 3%. Further economic analysis predicts that if mid-market enterprises (MMEs) boosted their export-based revenues by just 1%, they would increase their economic impact by $12.5 billion across the 14 economies. Half of all MMEs are estimated to be in China; a further quarter in India but per capita they have a larger profile in countries like Singapore, the UAE, Canada and Germany. In the UK MMEs are mostly likely to operate in the business services sector, which account for almost a third of mid-market activity in terms of economic value and employment, followed by manufacturing and financial services. 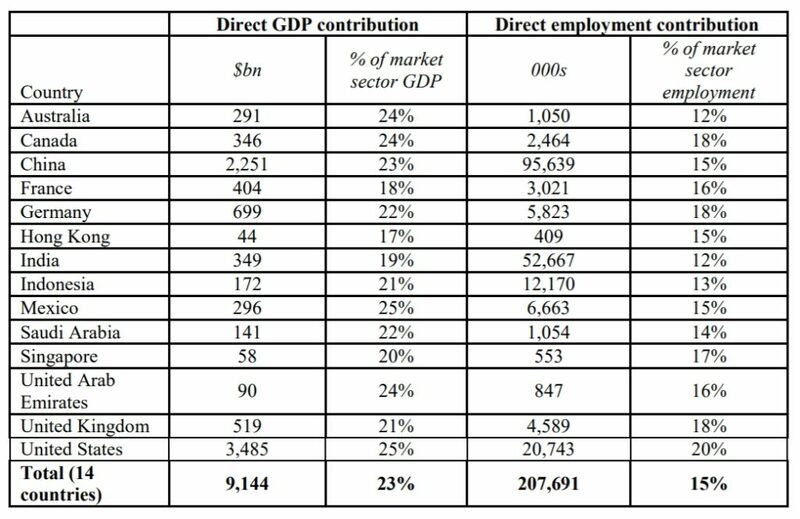 In HSBC’s sample, the MME sector makes the most important contribution to local employment in United States (20% of market sector employment) and the UK (18% of market sector employment), while their share of local GDP is highest in the USA, followed by Mexico, the UAE, Australia and Canada.